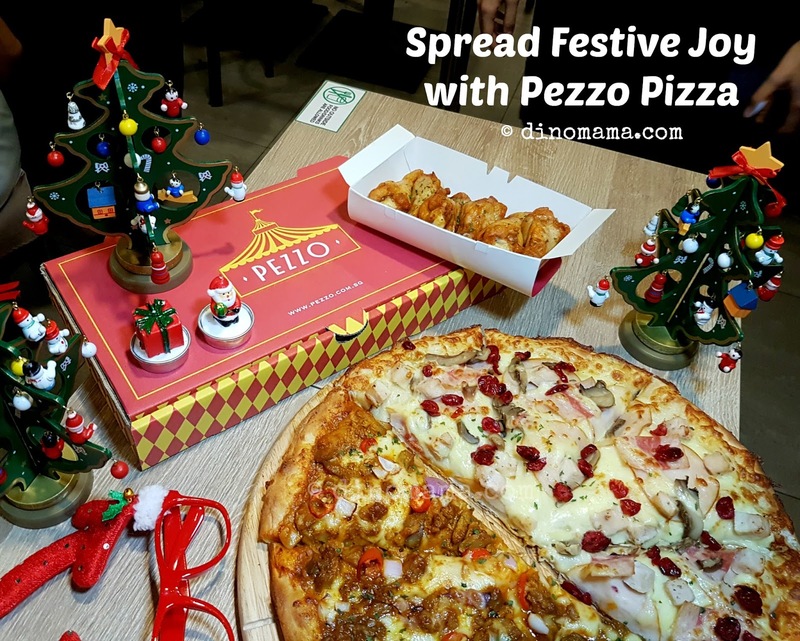 Ok back to business, the purpose of this Christmas party is to introduce Pezzo's 2 new unique festive creations that are specially created by Pezzo’s very own chefs *WOW! * The Carbonara and Flamethrower pizza, both under their Christmas menu. Think an enticing medley of roasted turkey bacon and ham, oregano chicken chunks, mushroom and mozzarella, all pulled together by creamy carbonara sauce and garnished with cranberries. My Verdict - Frankly, the first thought that comes to my mind when I read curry sauce with mozzarella cheese is HUH? Curry spiced mozzarella pizza? Well, the overall taste is not that bad, a little bit on the salty side; do note that I am not used to eating salty food, but not as weird as I thought it would be. The onions in the above photo looks raw but they taste soft with no raw onion after taste. Curry spice is not spicy too, I did not get the fresh chilli so does not know how that goes with the pizza. I enjoyed this pizza, unique taste but not too over powering taste of the curry sauce. 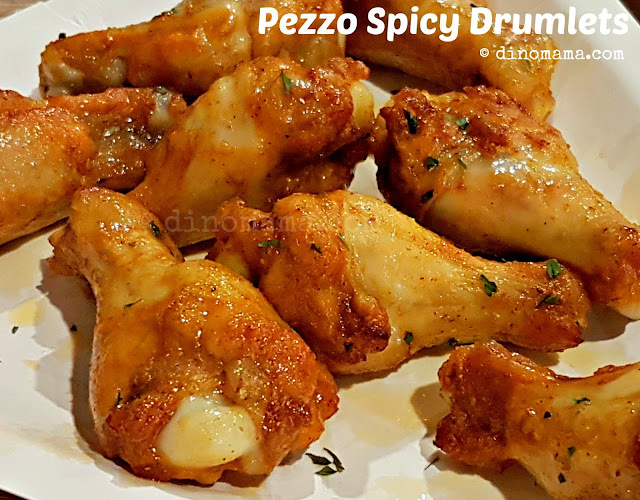 I so love love love LOVE~~~ these spicy drumlets~ and that is coming from a person who prefer midwings to drumlets and big fat chicken drumstick. Marinated on a secret blend of herbs and spices, baked in the oven (not oven oven but the pizza baking oven hor) these tiny little fella are something I would eat whole day! The skin is baked till crispy at some parts and easily tore off from the meat which is soft and juicy. I can handle chili of any level so did not find these drumlets spicy, DinoBoy who is still learning to handle spiciness said it was ok too but Serene from Xavvy-licious finds it too spicy for her liking. So eat at your own risk? Or share with friends who can take spiciness, they are sold at SGD5.60 for 6 pieces, so at least they can finish the rest if you can't take it. Can you see the pile of ingredients on the pizza? Pezzo is not stingy on the ingredients nor the toppings and every bite is a mouthful of goodness. The bread was not hard and dry, probably because they are made daily fresh on site. We were told that the pizza slice we had on that day was cut smaller pieces as they wanted us to savour the different type of pizza. I bought a slice of Pezzo pizza today and it was seriously larger that all the pizza slices I have seen. I was full after I finished that Cheesy Cheese slice. Will I patronize it again? Definitely! Hot pipping pizza on the go, why not? Yupe, Mysterious Man said it right! 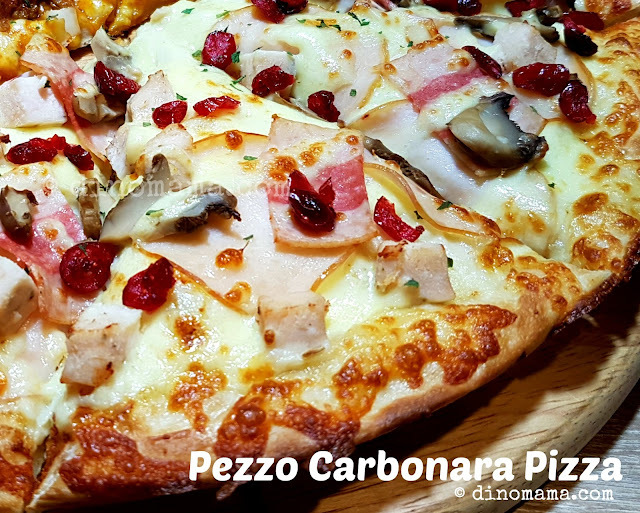 Both the Carbonara and Flamethrower pizza are affordably priced at SGD4.90 per slice. In fact there are 2 prices for Pezzo Pizza, its SGD4.90 per slice for the Gala Series and at SGD4.50 per slice for the Carnival Series. 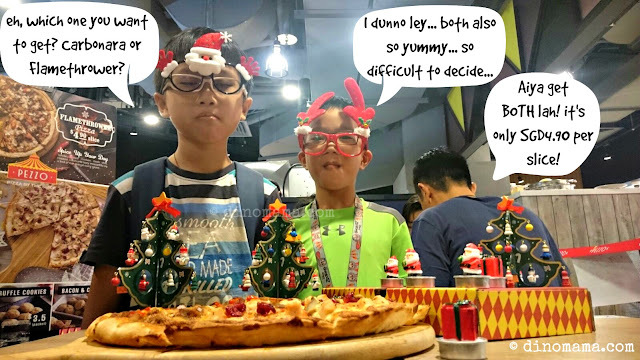 So if you are indecisive as these 2 boys; DinoBoy and Xav, grab one each! 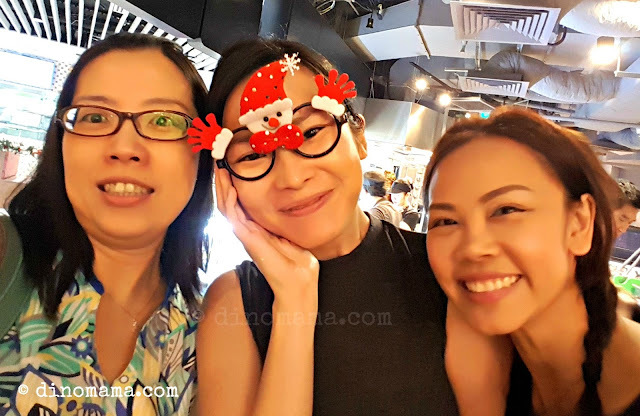 And if you are out shopping with your 2 best friends, get 3 slices @ SGD12.90; that will be SGD4.30 per slice OR a group of you decided to gather & have a "catch-up" session, why not order 6 slices that is equivalent to a 14" full pan @ SGD24.90; that works out to SGD4.15 per slice. Great deal right! *Price stated are valid for all Pezzo outlets except Pezzo Sentosa. All terms & condition applies. 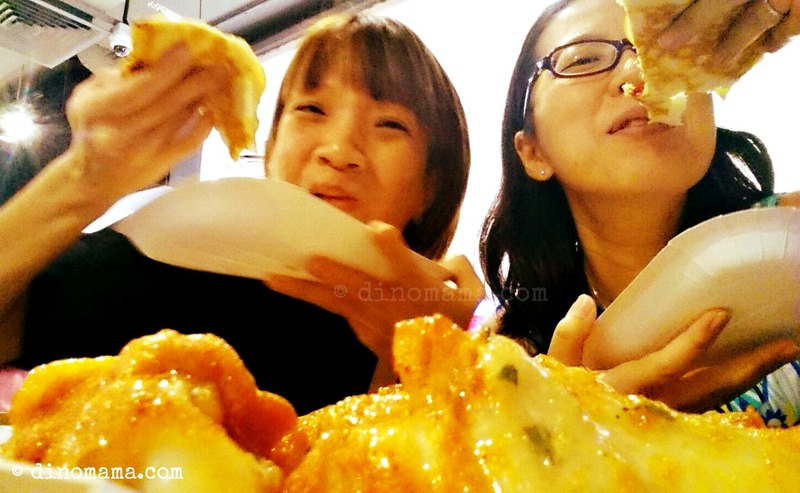 At Pezzo, fun is a way of life. 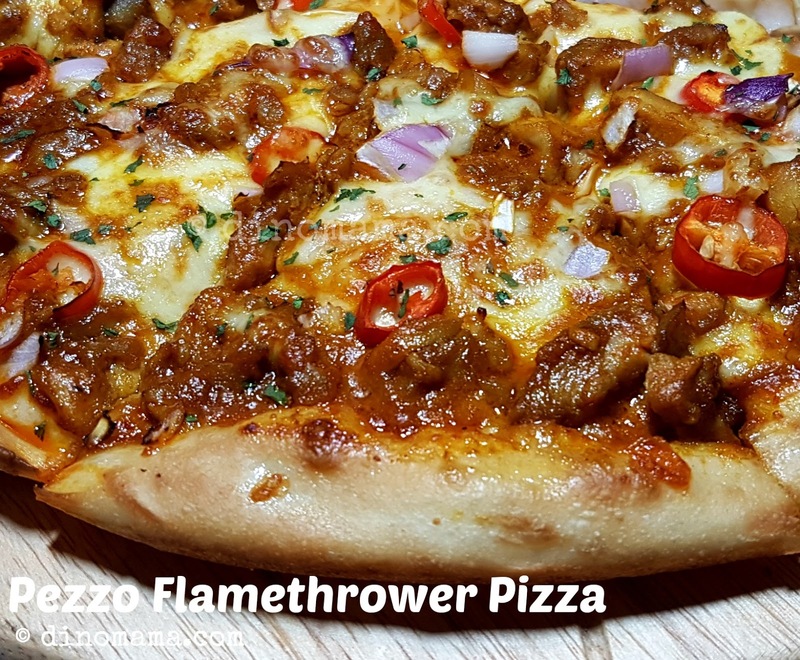 Their pizzas are inspired by the tapestry of circus life and they go by bold monikers such as “Big Daddy”, “Meat Munchers”, “Supremo” and “BBQ Bonanza”, just to name a few. Located in prominent shopping malls around the island, Pezzo Pizza is where customers can enjoy piping hot handcrafted pizzas baked daily with fresh and premium ingredients. Best of all, customers can enjoy different kinds of pizza flavours at one go as our pizzas are sold by slices. Click here to see the locations of all Pezzo Pizza outlets. Follow them at facebook and instagram for their latest updates and promo. 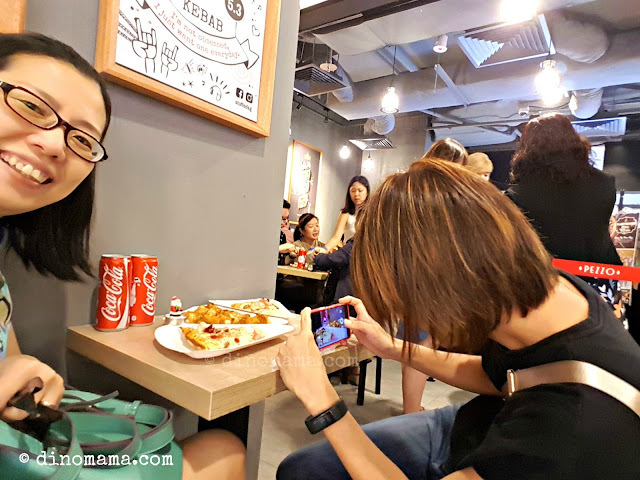 Amidst the aroma of freshly baked pizza and wings, the noisy chatty us - the food bloggers, at a corner sat a petite sweet looking lady with non food related items laid out all over the small table. 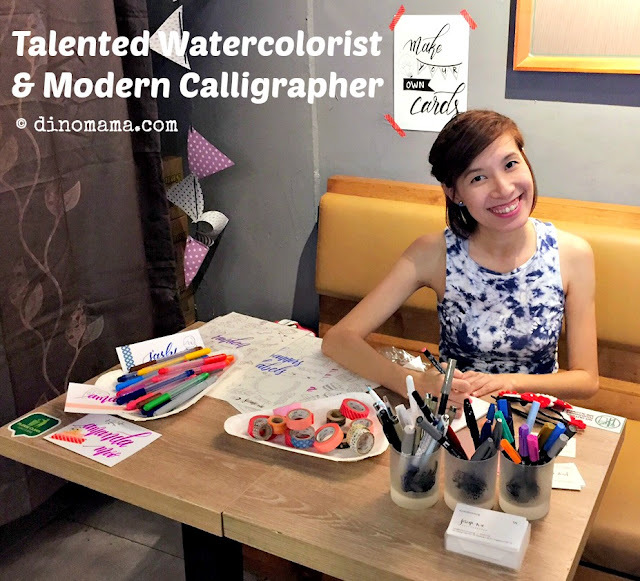 Pezzo Pizza has invited Serene Wu, a talented Watercolorist and modern Calligrapher, to do a live brush calligraphy at the event where she will write out our names and we can decorate the card with drawings or washi tapes she provided. Cool idea! She wrote both DinoBoy and my name, its exquisite but I can't show you coz I'm don't share my boy's name publicly. DinoBoy was intrigued by her work and kept hanging around her table watching her work. If you brush calligraphy is easy peasy than you are wrong! There are different strokes to use, the pressure to use on each stroke and of course color matching if mixture of color are required. Not easy I tell you! Serene is part of the calligrapher team from The Workroom, a place where you can find workshops for calligraphy, rubber stamp making, food painting watercolor illustration etc Check out their workshops schedule here, this school holiday why not learn something new while taking a break from all the hustle and bustle of kid's schedule? Beside hosting workshop or engaged in private events, The Workroom also does weddings and art commission too! Hurry! Contact them at info(at)theworkroom(dot)sg and engeage them for your year end Christmas and New Year parties! Last but not least... Behind the Scene! 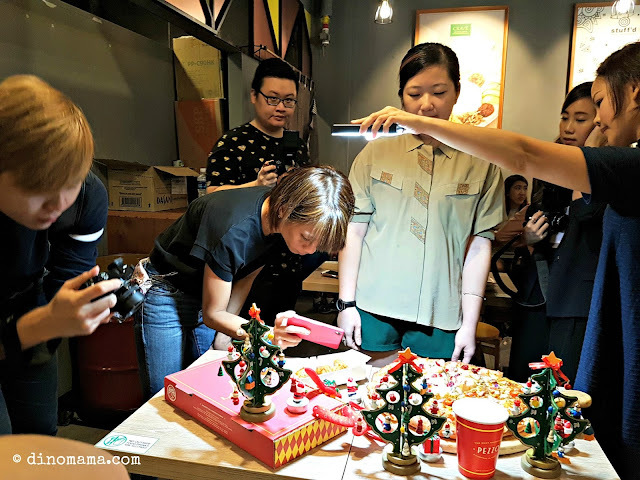 Others always have an idea or image that during food tasting session, food bloggers only go there to chin chai or anyhow snap photos of the food then start to eat and be merry, You guys are so totally wrong! We really work hard for the organisors and it gets challenging when we bring our kids along because we know they are not always 100% cooperative every seconds or minute. 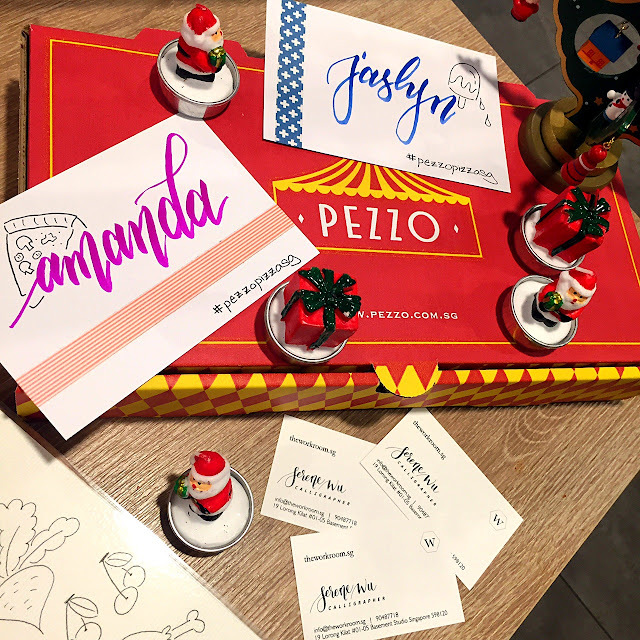 Here's what we did at Pezzo Pizza Christmas Party. For about 30mins before the food tasting, we "molested" the pizza and wings from each angle, up close and from far, not a side of them were spared. Oh, the people who invited us are not spared too sometimes hahaha~ I was in the midst of talking when I press the shutter button, ended up I look so fierce in this photo. Have a great day every one! And Munch On! 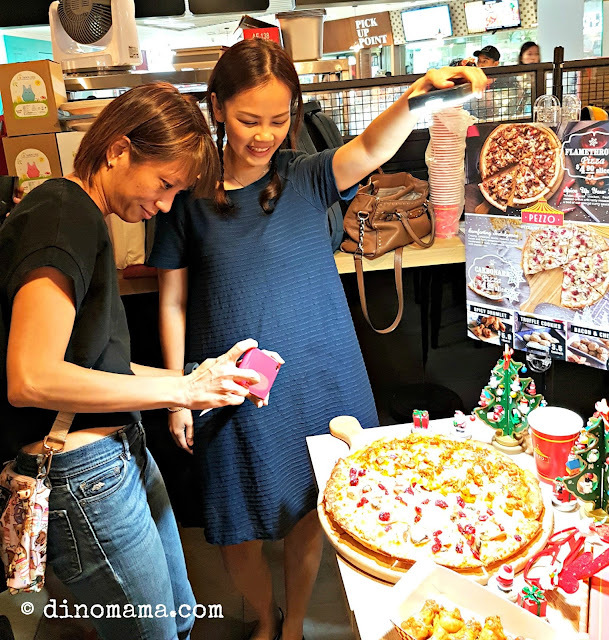 Disclaimer : We were invited by Pezzo Pizza for a food taste session. No compensation was received and no obligation to write about it but we decided to go ahead and post on the event because we totally enjoyed it. All photos in this blog post belongs to The DinoFamily, you may not use them without seeking our permission.